The 2016 Colorado Springs Parade of Homes is coming soon, and Action Team Realty will be showcasing an amazing home! The Parade of Homes offers the general public a first-hand look at the current trends and greatest innovations in new home design – featuring 27 homes by 24 builders. During this event, participants can check out the latest and greatest in home designs, decorating trends, technology, and neighborhoods – from affordable living to luxury dream homes. Homes range from just 256 square feet to almost 10,000 square feet, at prices from $100,000 to more than $1,500,000! This year, the Parade will feature 27 homes by 24 builders throughout the city. This year the Parade runs from August 3rd through the 21st 2016. Homes will be open from 10 am to 6 pm Wednesdays through Sundays, with Parade homes closed Monday and Tuesday. Get complete details and see what homes are on the tour at www.springsparade.com. While some people attend the Parade of homes in search of their next dream home, a lot of people come to get ideas for their own house. There’s a new app this year that can help to guide you through the homes and help you easily save decorating and materials information, from paint colors to furnishings. You can also purchase Parade tickets, peruse home maps and photos, and rate the homes! You can download the app on Google Play or the App Store. If you are a past or current client of Action Team Realty and would like to receive 2 free tickets, email us at Laurie@ActionTeamCO.com to reserve yours now! Tickets are limited, so reserve yours today. Tickets may be picked up Monday-Friday from 8-5 at our office located at 2790 N. Academy Blvd, suite 180, Colorado Springs, CO 80917. Regular admission tickets are $10 for adults. Kids under 17 get in free. Your ticket is good for the entire three-week run, and will get you access to any of the featured homes. Tickets can be bought at Safeway and Albertson’s stores, online, or at any of the Parade homes during the Parade. Active duty and retired military can receive complimentary tickets while supplies last at Mike Shaw Buick GMC, located in Motor City and from USAA Real Estate Rewards located at 1855 Telstar Drive. In addition to just touring the homes, several seminars will be hosted by local professionals on topics like lighting, home technology, landscape design, and more. These seminars are a great opportunity for you to get ideas to incorporate into your own home. Check out the calendar of events below to see which classes interest you. All About Home Design – 6 PM at 14505 Millhaven Place – Learn ideas on how to have a beautiful home, yet making it warm, inviting and personal. You can sign up for this class at “The Cottage at Millhaven” home. Space is limited – sign up early! One of this year’s featured homes, La Visiere, is listed and will be hosted by Action Team Realty – located in the Flying Horse community at 1797 Redbank Drive. With the backdrop of Pikes Peak in full view, the La Visiere stands proud against the Flying Horse golf course. 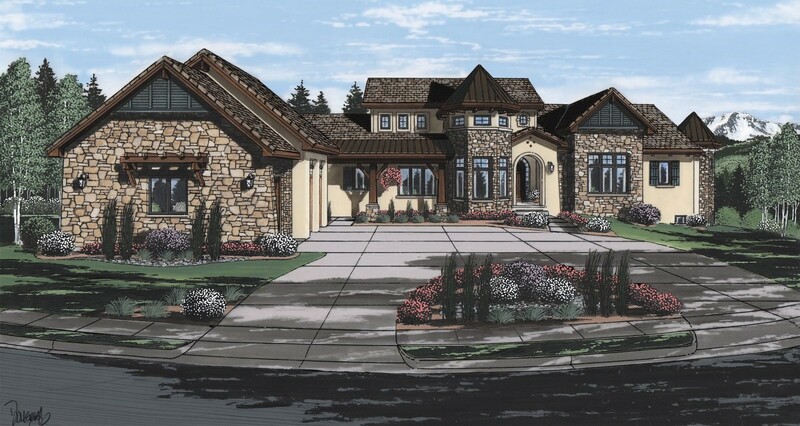 With a combination of wood, stone and stucco, the exterior boasts a distinctive French Chateau style. The custom-crafted 10’ tall front door adds a bit of rustic elegance to the exterior design. As you enter the home, you’re greeted with impressive trim moulding and rich colored hardwood flooring. The main level, boasting almost 3300 square feet, is comprised of two bedrooms, great room, impressive kitchen and dining room, large mudroom/craft room, and study. A large wood-burning fireplace is a great focal point in the spacious great room. And the majestic windows lead you out to an expansive outdoor living area, overlooking the awe-inspiring view of Pikes Peak and the Front Range. The chateau style continues as you walk to the lower level down the stone stair tower and enter a fabulous entertaining space. The recreation room is complete with a large movie watching area, billiards table and gaming table areas. A wet bar and wine room adds to the entertaining value in this amazing space. Three bedrooms, three baths, a second laundry, and exercise room finishes off the lower level. Each room is thoughtfully considered to bring a sense of the French Chateau style, with aged farmhouse touches. A perfect home for entertaining family and friends, both inside and out. A French Chateau inspired design of elegant lines and rustic touches served as the catalyst for this home’s decorative finishes. You are welcomed with a soft, cool palette of pale blues, distressed ivory and deep slate grays; a soothing background for abundant natural materials and delicate details. We have used gracious yet durable brick, hefty wood beams, old world lighting and reclaimed wood in the design, beautifully set off by exquisite white marble. The result is a refined chateau style with the warmth of an aged farmhouse. This dramatic floor plan seamlessly blends the interior with the exterior. La Visiere combines perfect harmony and grand style. The home is centrally controlled with a Control 4 home automation system. All of this, coupled with custom cabinets and top of the line appliances, and majestic Colorado mountain views make this dream home a must see. Take a breath and slow down as you arrive at the beautiful La Visiere with surrounding backdrop of Pikes Peak. This alluring view is sure to take your breath away. commands time to stand still, if only for a moment. Continue this intervening period of time as you pass through the front door and come inside to take your own interlude from the hustle and bustle of life. Galiant Homes has a true passion for providing an amazing experience and superior quality to new home owners. Galiant Homes focuses on creating lifestyles, not just homes, in the custom home market. Steve Miller, owner of Galiant Homes, is an experienced home builder. A former Army officer and West Point graduate, Steve has built nearly 1,000 homes in his 14 year career. Steve set out to bring his passion for homebuilding to his clients when he started his company. Galiant Homes focuses on the design-build approach to seamlessly integrate the client, builder, designer, and trade partners to create an enjoyable experience for their homeowners. Galiant Homes is always utilizing the newest techniques in energy efficiency and technology to create a one-of-a-kind lifestyle for each and every client. Specializing in superior custom homes, Galiant Homes is known for their great flowing floor plans and quality detail. We are a customer-centric builder dedicated to creating a home of lasting value and beauty. Let Galiant Homes help create your lifestyle. Visit them at www.GaliantHomes.com for more information.